When a user tries to upload a file larger than 12Mb, CKFinder doesn't provide any feedback about the max size limit. It displays (Upload in progress, please wait...), but never alerts the user that the upload failed. The server is returning a 500 Internal Server error. Is there a better way to do this? Not sure if this API section will help you, but it might give you some ideas on how to deal with your problem. I suspect it's a corrupted JPG file that is causing the issue. I'm going to try to get a copy of the file and test it. I'm also going to try to upgrade to the latest version of CKFinder. I found that the image in questions was set to 300dpi. The file size was relatively small, though, 350k. This problem seems to be in resizing a 300dpi image, specifically for thumbnails. The uploaded image is properly resized to fit within 1600 x 1200 px, but the thumbnail always throws an Out of Memory exception. 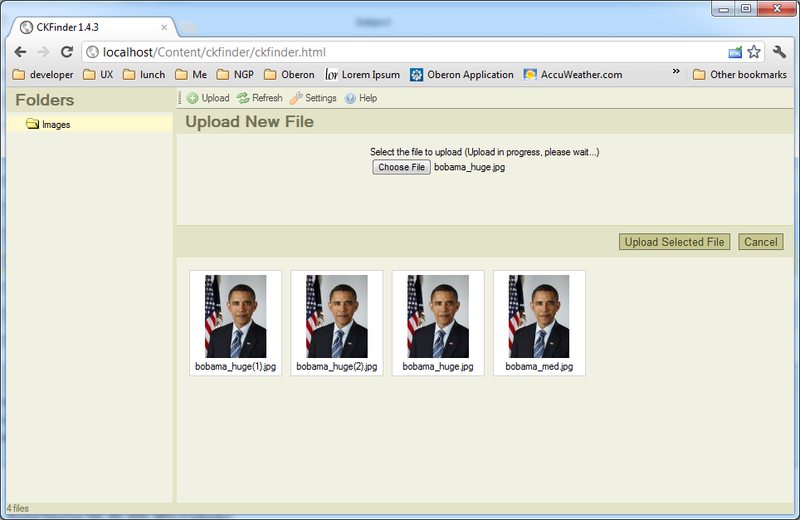 Thumbnails are configured to fit within 100 x 100 px. Since this exception is not caught properly, the UI returns an "Unknown error" message to the user, which is not very helpful to the user. Does CKFinder 1.4x have a known issue with 300dpi images? CKFinder 1.4.3 was released 2 years ago. Can you check CKFinder 2.2? Yes, I'm already in the process of upgrading. The issue we have is in production now and I can't get the upgrade in very quickly, pending approval and QA time. I was hoping there's a more immediate fix for it. Thanks!